Get everyone involved in this soccer game for u6 soccer players. This 3v3 game has 1 extra offensive player and is a great way for players to learn the basics of shape and team play. Set up 3v3 game as a typical scrimmage. - 3 players on each team, plus 1 extra neutral player that is always on whichever team that has the ball. - Let the kids play a 3 v 3 game but the attacking team will always have an extra player to allow for more options, and more success. - Designate the neutral player by wearing a different colour vest. - Rotate every few minutes so all players get to play that role. - Coach the shapes players should use, triangles and diamonds. - These 2 shapes should always provide a minimum of 2 passing options, and encourages good supporting angles. 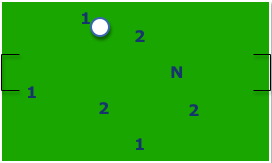 - Small sided games like 3 v 3 allows for players to constantly be involved and getting lots of touches on the ball. - 10 minutes for this 3v3 game.